I am very excited about sponsoring and hosting PLATO Testing Team members at this year’s conference as the PLATO initiative is helping to train and employ new members of our testing community. 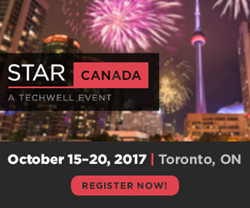 TechWell is excited to announce STARCANADA’s inaugural Test Lab, where attendees get to "break" software for a good cause and network with their peers at the same time. The Test Lab will focus on testing Humanitarian Toolbox code, which is code from applications that have become vital resources for many disaster relief organizations. This year the popular STAR conference networking event will also be in partnership with PLATO Testing (Professional Aboriginal Testing Organization, Inc.). PLATO Testing is on a social mission to help Aboriginal people across Canada get jobs in the IT industry. The young Indigenous population are among the highest undereducated and underemployed. PLATO Testing’s training-to-employment program improves these statistics. Additionally, current Aboriginal testing students from the PLATO Testing organization will be attending STARCANADA on scholarship and assisting other attendees while working in the Test Lab.